Diamond Bar Community Preschool was founded in February 1966. The school is a non-profit parent participation preschool, where parents assist a professional teacher in the classroom on a rotating basis two to six days per month, contribute to an assigned committee, and participate in fundraising and housekeeping activities. Our school year runs from September through June. With the cooperative efforts of credentialed teachers and parents, we are able to provide a 4:1 ratio (of students to teacher) where children are exposed daily to a variety of Art, Math, Science, Language activities, and Dramatic Play. The idea of a co-op extends in the lasting friendships and partnership with other parents and staff: working together to make the best first school experience for our children. The co-op spirit is what what makes us unique and what parents enjoy most about the school. Once you've entered the doors at DBCP, you'll know you have entered a special place. 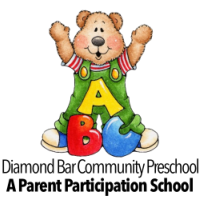 Diamond Bar Community Preschool's well equipped, age appropriate classrooms are filled with carefully chosen open-ended toys, books, puzzles, blocks of many shapes and sizes, dress up clothes and dramatic play equipment. Children are given many opportunities for personal creative expression and artistic exploration. You'll find children busy dressing up in costumes and role-playing, enjoying a story with a teacher or helping parent, building with blocks, creating colorful pieces of art, singing and dancing. Our preschool day incorporates a balance of different experiences: self-initiated and guided; group and individual; active and quiet; fine and gross-motor. DBCP is child-centered, and with a low child-to-staff ratio, each child receives individual attention, care and a fun introduction to learning at our school. The school is licensed by the California Department of School Welfare and is a member of the San Gabriel Valley Council (SGVC) and the California Council of Parent Participation Nursery Schools (CCPPNS). The purpose of these associations is to maintain mutual aid and exchange of information for all co-ops and members of co-ops. "Parents and teachers working together to build a foundation for life long learning. " The objective of our school is to create and maintain a safe, nurturing environment of highest quality, where children and families learn together. With 7 working parents and two credentialed teachers, we are able to provide a 4:1 ratio (of students to teacher) where children are exposed daily to a variety of Art, Math, Science, Language activities, and Dramatic Play. Mitzie has been at DBCP for 17 years and has over 36 years experience working with children ages 3 months-12 years old. She has worked both as a director and teacher in many different school settings. She worked as a kindergarten teacher for many years with autistic children mainstreamed in her class. She is also the mother of two young men whom she is very proud of. "Teaching is my life. It is such a rewarding job. Each child that comes my way is a unique individual and it is my mission to provide them with a place to grow and learn intellectually and socially, while developing a high level of self-confidence. I am proud to help build our future!" Pamela has been affiliated with Diamond Bar Community Preschool since 1999. Her youngest child attended DBCP. They both loved the experience. After her son graduated form DBCP, she continued to be a paid substitute. She was hired on at the school in 2003 as a teacher's aid and later became a teacher in 2005. She and her husband, Shawn, live in Diamond Bar and are the parents of four wonderful children. "I wish everyone could share in the experience of a co-op preschool. It is wonderfully hands-on, for both you and your child." DBCP is located on the campus of Northminster Presbyterian Church with whom we have a landlord-tenant relationship but have no affiliation with any church community.